Your brand most likely operates its website on a domain with the company’s name. Or perhaps your matching domain wasn’t available. Diving deeper into the world of domains for your content marketing purposes will allow you to find helpful opportunities. Are you planning a new microsite or content hub? Looking for custom domains for a campaign? The options can be overwhelming – what extensions should you use, how much should you pay to acquire the domain, what can you do to avoid premium prices? Sit tight. I’m going to teach you about making smart decisions about domain extensions, what add-ons to include, and how much to budget for a domain. If you want to ensure that your brand captures its alternative extensions or to identify a new extension related to a singular purpose, here are a few of the most popular you need to know. .com is the most common top-level domain. It stands for commercial, but the authority of a .com has more to do with perception than it does its meaning. When people see it, they register it as a credible website. .io is a domain extension popular with startups, video games, and other online services. Many people read io as standing for input/output, but it was created for the Indian Ocean region. People are drawn to .io domains because of their brevity. .co is the official extension of Colombia, though, practically, .co is frequently used worldwide to signify company or corporation. .ai is usually reserved for artificial intelligence-driven companies and the country Anguilla. .net was a popular and acceptable domain extension, but I typically advise against using it because it has lost credibility as a top-level domain. .org extensions are suitable for groups, organizations, charities, and more. 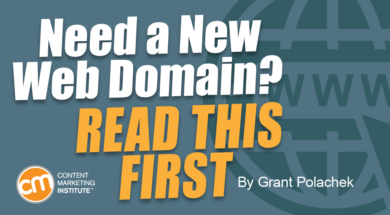 There are a ton of newer generic top-level domains (gTLD) that you can apply to your domain, too. Extensions such as .agency, .app, .coffee, and more can be specific to your industry. Don’t worry that people won’t find your site without an exact-match domain. Put some faith in the intelligence of your customers and their ability to use Google to find you. Front-side add-ons are what they sound like – words added to the beginning of a domain. Front-side add-on words are often shorter and more basic than domain phrases, though overlap occurs sometimes. A few common front-side add-ons include: “We Are,” “Get,” “The,” or “Shop” in front of the business name. Dropbox used GetDropbox.com for several years before purchasing Dropbox.com. These usually are cookie-cutter additions, but they still provide a way for businesses to find a short domain at an affordable price. In addition to phrases, which are usually placed at the front end of a domain, there are back-end add-on options. They usually are industry-specific. For example, Tesla used TeslaMotors.com for years before investing in Tesla.com. When it comes to industry add-ons, be intuitive. Intelligentsia uses the domain IntelligentsiaCoffee.com, not something like IntelligentsiaBeverages.com even though it sells tea and operates cafes. Back-end add-ons are another great way to find a unique domain without the premium price tag. If the above solutions won’t work and you still need a short, exact-match .com domain? Well, get out your wallet. You’ve entered the premium domain market. A premium domain is available for a fee in addition to standard registration costs because another entity already owns it. In most cases, a domainer or domain investor purchases the URL intending to resell it for a profit. This process is comparable to the way people invest in real estate, expecting the value to increase and to sell it in the future. Premium domain prices are set by the seller but often range from a few hundred to thousands of dollars. $60,000 to $150,000 domains are typically short or have highly sought .com extensions. $3,000 to $50,000 domains are strong abstract ones like Invixi.com. Short two-word combinations often fall into this pricing tier. $1,000 to $3,000 domains include many great .com domain options, including transmutations of two words, longer two-word combinations, or creative abstract names. When picking your domain, it is important that you consider what kind will best support your business goal. If you need an exact-match domain, how much are you willing to pay? If you are open to extensions other than .com, what will best serve your brand? Are there any clever or appropriate add-ons you can use with your name to come up with a strong, memorable URL? Be proactive and include domain names in your planning stage – whether it’s a new content hub, a marketing campaign, or a new business name, factor in what domains would work best and if you can afford them or whether you need to figure out something else. Up-front planning will allow your domains to support your brand purpose and drive you to success. Check out one of our favorite domains, www.ContentMarketingUniversity.com, to find out all the details on spring semester. Enrollment ends March 31. Sign up today. Grant Polachek is the director of marketing at Inc 500 company Squadhelp.com, the worlds #1 naming platform, with nearly 20,000 customers from the smallest startups across the globe to the largest corporations including Nestle, Philips, Hilton, Pepsi, and AutoNation. Get inspired by exploring these winning company name ideas. Follow Grant on Twitter @grantpolachek.